Leeds United head coach Garry Monk. Easter has never traditionally been a good time for Leeds United, but they can all but seal a place in the EFL Championship play-offs with two good results over the Bank Holiday weekend. After their 3-0 win over Preston the Whites have crept closer to their promotion goal and go into this weekend’s double header five points ahead of seventh-placed Fulham and three in front of sixth-placed Sheffield Wednesday with a plus four better goal difference. They are also within one point again of Reading, in fourth, with a much superior goal difference after their shock 7-1 mauling at the hands of Norwich last Saturday. 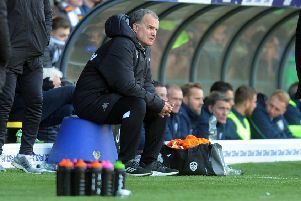 The twists and turns are taking shape and Leeds will be hoping they are on the right end of them this week, although they are aware they face a tough task to pick up the six points they are after as they travel to title challengers Newcastle on Friday then face a much improved Wolves side on Monday. The first of the matches brings together the division’s two biggest clubs, supporter base-wise with so much at stake for both. The pressure is certainly on for the Magpies in their chase for the league title after they lost top spot following a defeat at Sheffield Wednesday, but they do have the most expensively put together squad in the division and have used it to their advantage to be right up there at the top all season. Interest in their clash has been huge with tickets having sold out weeks ago despite the Sky TV coverage and there will be a battle on the sidelines as well as on the pitch with two of the most vocal sets of supporters in the country likely to fill St James’ Park with noise. Leeds go into the game back on track after defeats in their previous two matches and with some confidence renewed, particularly for young midfielders Ronaldo Vieira and Kalvin Phillips and young attacker Kemar Roofe, who all returned to form in a big way against Preston. Skipper Liam Bridcutt was injured, but not missed with Garry Monk’s decision to go with his two most inexperienced midfielders fully justified as they proved the star performers. “They showed me a good attitude this week, the pair of them in training and I had no problem whatsoever putting them in there,” said Monk. “They know exactly what’s expected of them. I know they’re young boys and they’re still learning the game but I trust all my players and they showed me a really good response after Tuesday in training. Bridcutt’s progress from an Achilles injury will be monitored this week before the team is chosen for the trip to the north east. Defender Liam Cooper is unavailable after his six-match ban and back up goalkeeper Marco Silvestri has picked up knee ligament damage likely to keep him out for the rest of the season. But winger Hadi Sacko is back in contention after overcoming an ankle injury. Ahead of the Newcastle game, Monk said: “I don’t think there is any pressure on us. “Our objective at the start of the season was to put foundations in place and improve all football matters and we have done that. “Now we have got a new objective which is to get into a play-off place, but we were never expected to be in this position. “There are ups and downs along the way and it is impossible to win every game. If we suffer again in these next five games then I am sure you will see a response.